Sign up to Dry July Australia 2018 and raise funds for The Royal Melbourne Hospital. The Royal Melbourne’s comprehensive cancer services are available to every Victorian in need of cancer care, support and treatment. Our service is internationally renowned and is one of Victoria’s largest cancer care and treatment centres, treating thousands of patients each year. As demand for cancer services increase, there is growing pressure on equipment, patient care items and infrastructure resources which are critical to ensure we to provide excellence in cancer care. With your support this Dry July, we’re aiming to raise much needed funds which will enable The Royal Melbourne continue to provide the best possible care for our cancer patients. Your fundraising for Dry July in 2018 has enabled The Royal Melbourne Hospital to purchase vital equipment for our Haematology Ward, such as a Portable ECG machine that can help us pick up heart abnormalities. For patients in isolated rooms this means that they can have an ECG taken without the machine in the room and this will reduce the risk of spread of infection. Cancer-survivor Shantelle has been coming to the RMH to receive treatment for cancer from our Head and Neck team. Her dad, Peter, did Dry July last year to support her and to help raise money for cancer services at the RMH. With thanks to Peter and all of you who participated in Dry July, the Head and Neck team will also be getting some new equipment which includes iPads for patients to use while they are receiving treatment – a simple thing that can make a huge difference! On behalf of Shantelle, and our cancer patients across Victoria, we say THANK YOU – you’ve helped us transform the lives of people in their greatest time of need. We're proud to announce that Royal Melbourne Hospital has received a grant from the Dry July Foundation 2018 Grant Program. 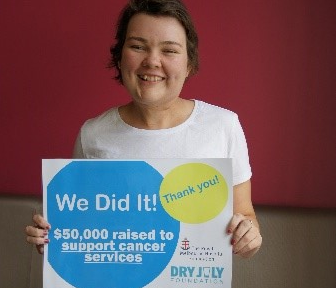 Peter’s daughter Shantelle has bravely battled cancer, and he has decided to do Dry July in her honour. 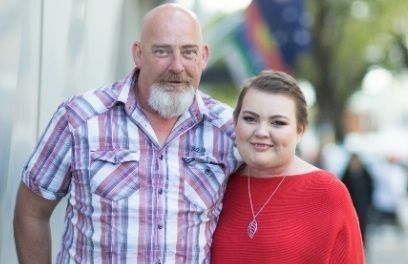 Shantelle was treated at Royal Melbourne Hospital, so when Shantelle asked her dad to go Dry in July to raise funds for Royal Melbourne Hospital, he immediately said 'No worries, I can do that'. 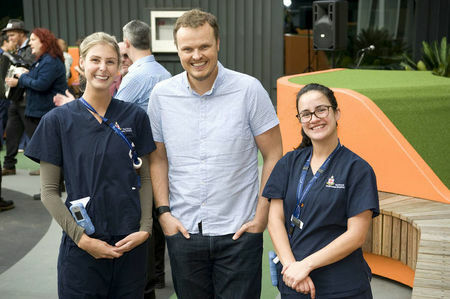 By raising funds this Dry July, Peter is helping The Royal Melbourne Hospital continue to provide the best possible care for their cancer patients. “My strategies?”, said Peter. “Tie my hands behind my back, don’t visit anyone and just drink coke and water. All good things come…Finally the roof-top garden has been opened and is available to patients at Haematology and Bone Marrow Transplant ward at Royal Melbourne Hospital. Over $250,000 in funds raised by Dry July participants went into this beautiful and calming facility. This space allows our patients’ and their families to connect with nature and the great outdoors, to give their thoughts and minds some respite, and to encourage a sense of community, in a place that is away from home. On behalf of the staff and patients at The Royal Melbourne Hospital, thank you so much for the grant for the oncolology telemedicine room. The project is now complete. The telehealth team were honoured to be offered the opportunity to facilitate innovation of care delivery for oncology outpatients through funding from the Dry July Foundation. With the generous support of the Dry July donation we have been able to purchase several key pieces of infrastructure to enable easy access to videoconferencing for our oncology patients. In addition to telehealth being available in every outpatient room, the oncology team can also perform multidisciplinary meetings in their usual group meeting rooms via videoconference. Professor Kate Drummond (brain cancer surgeon) and Dr Kathryn Field( medical oncologist) have been our lead clinical champions in tele-oncology. Through their contributions we have successfully saved cancer patients travel time and costs. We look forward to promoting increased utilisation of telehealth capabilities in oncology. We are grateful to the Dry July Foundation for assisting us in this journey. Your support and commitment to The Royal Melbourne Hospital is so invaluable to us and we thank you again!